Family Games Night is Supposed to be Fun. So Why is Everybody Crying? This blog post is based on my recent CBC Radio parenting column about kids and board games. It seemed like such a good idea at the time: scheduling a family games night. Back when you first added “family games night” to the calendar, you had a picture in your head of how much fun this night would be for you and your kids, with everyone talking and laughing as you moved your game pieces around the board. Of course, that fantasy only lasted until the moment you actually started playing. Then, before you knew it, one kid was crying, another was stomping out of the room, and you were left wondering how it could all go so wrong so fast…. As it turns out, this is a pretty common scenario. It’s not just your family that has a hard time playing board games. Almost every parent I’ve talked to about the supposed joy of family games night has a board game horror story to share with me. Kids crying, parents trying to convince them that there’s nothing to cry about, kids crying harder. It’s the stuff of which not-so-great family memories are made…. Fortunately there are things you can do to put the fun back in family games night. One option is to make a point of playing cooperative games (games that encourage players to work as members of team that is pursuing a common goal like solving a puzzle). Now I have to say, I didn’t have a lot of success getting my kids excited about playing cooperative games during their growing up years. Some of the games I purchased at the time were (dare I say it?) pretty boring! But apparently cooperative games have come a long way since then. In fact, according to a couple of parents I have spoken with recently, the current generation of cooperative games (games like Codenames, for example) are challenging enough to actually be fun for adults and kids alike. Trust me: that’s a big improvement! Another option is to tweak the rules of traditional games to make them a little less cut throat. This is the approach my friend Cathy chose to take when her two daughters were growing up. I have fond memories of our two families playing Cathy’s kinder, gentler version of Monopoly. Here are a few examples of how the game would work. If a player was down on her luck, the other players could help that player out by paying her tax bill or picking up the tab for her rent as opposed to gleefully driving her into bankruptcy. Likewise, a player who was lucky enough to land on “Free Parking” and who got to scoop up all the free money was expected to share that financial windfall with other players. Cathy’s version of the rules didn’t make the game any less enjoyable — but it certainly cut back on the tears. I don’t have a single memory of any player crying. Not ever! Recently, I had the opportunity to speak with another parent, Jenny Raspberry, who has found other creative ways of tweaking the rules of traditional games to make them more fun and less cut throat for her two school-aged kids. Starting when her kids were really little, she gave them the opportunity to play grown-up board games, but in a way that wouldn’t be too discouraging or too frustrating. She started out by giving her kids the chance to join a team led by an adult. A five year old’s role as a junior member of the team might be to role the dice or spin the game spinner or to move the game piece around the board (the actual fun stuff when you’re a five year old). Being part of a team gave her kids a way to be part of the game and to learn the rules in a non-threatening, age-appropriate way. And if the team lost, it was no big deal because it wasn’t the child’s loss, it was the team’s loss, and so it felt a whole lot less personal. Of course, some people may wonder if it’s a good idea to dial back on that element of competition. After all, don’t kids have to learn how to hold their own in a fiercely competitive world? Sure, they do have to learn that lesson eventually — but I don’t think we have to go out of our way to look for opportunities to teach them that lesson. Life has a way of delivering those kinds of learning opportunities on a fairly regular basis, after all. Jenny has found some sensible middle ground. She tells her kids, who are now eight and ten, that they won’t always have the opportunity to play by their family’s kinder and gentler board game rules. There will be times when they are playing board games at someone else’s house when they’ll have to play by the official (and inevitably harsher) rules. She also tells them that they’ll have to practice being gracious losers and gracious winners so that other people will actually want to play games with them again. So it doesn’t have to be an all-or-nothing proposition (you don’t have to raise kids who are only willing to pay cooperative games or competitive games) and the rules can evolve over time, as kids get more practice at being good winners and good losers. Another way to reduce the amount of crying during board games is to ask yourself upfront what kind of experience you want your family to have while they’re playing the game — and to choose your board game accordingly. This is something Jenny thinks about a lot. She loves playing board games as a family, but that doesn’t mean she’s necessarily a fan of every kind of board game. Frankly, she’s not…. She explains: “I feel like any game where you can be purposefully malicious to another player…. [tends] to lead to more harsh feelings.” These types of games also tend to trigger a desire for revenge — and those aren’t exactly the kinds of feelings she wants to be promoting when the goal is to have a fun time as a family. That’s not to say that you want to avoid playing cut-throat games entirely, but, if you do decide to play that kind of game, maybe you want to talk a bit about what’s happening in the game. Is it fair that a few lucky rolls of the dice can give a particular player a huge advantage? How does it feel to be one of the other players in the game — say a player who is really down on his luck? As it turns out, that was one of the original intentions of the inventor of the 1904 board game The Landlord’s Game – the game that inspired Monopoly: to spark these very types of conversations. The inventor of that game, Lizzie Magie, had envisioned her game as a critique of capitalism. In fact, at one point her game came with two very different sets of rules: one set that promoted widespread prosperity (a world in which every player had the potential to do well) and one set that created a winner-takes-all situation (the version of the game that inspired Monopoly). So it’s all about finding that sensible middle ground: a way to make family games night fun as opposed to a source of mutual dread. Let the board games begin! Ann Douglas is the author of numerous books about parenting including, most recently, Parenting Through the Storm. Her brand new book, Happy Parents, Happy Kids, will be published by HarperCollins Canada in February 2019. The Mother of All Toddler Books, The Mother of All Toddler Workshops, and more! Sometimes I get so busy blogging about all things parenting that I forget to tell you about all the exciting things that have been happening behind the scenes. I haven’t done a very good job of telling you, for example, that there’s a brand new edition of The Mother of All Toddler Books on the bookstore shelves — a massively revamped edition that takes into account the most important things we’ve learned about toddler development over the past 15 years, when the first edition of the book was published. Of course, what hasn’t changed is the book’s fiercely Canadian perspective: the fact that it incorporates recommendations from Canadian health authorities and includes the voices and stories of Canadian parents. It’s still very much a “mother of all” book, in other words. 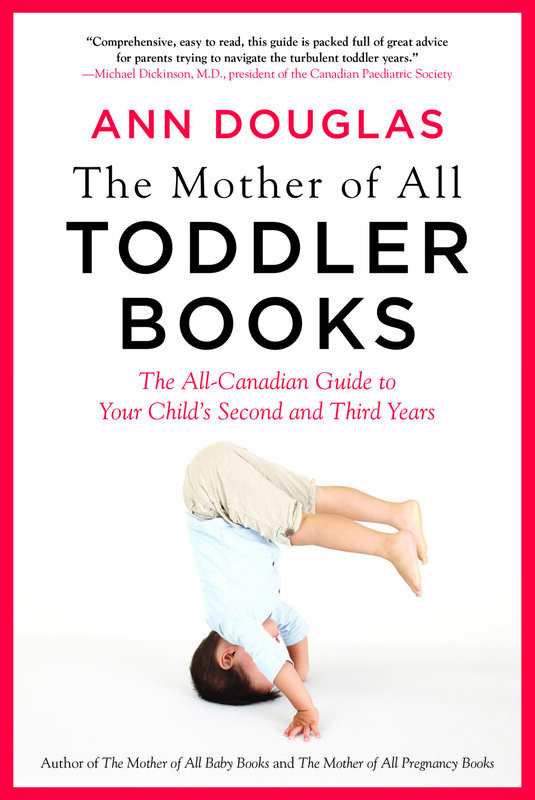 Anyway, now that there’s a brand new edition of The Mother of All Toddler Books to share with the world (or at least in the tiny little corner of the world that is Canada), I’m going to be doing a fair bit of speaking about toddlers in the coming weeks. This weekend (October 13 and 14), I’ll be at The Baby Show in Toronto, hosting two rounds of Toddler Trivia — a fun, interactive game featuring the most exciting prize imaginable. (No, it’s not a car! It’s a signed copy of The Mother of All Toddler Books!) Anyway, you can join in the fun on Saturday or Sunday afternoon at 1 pm. I hope to see you there. On October 23, I’m joining forces with Hello, Baby! (a doula service and childbirth education company in Peterborough, Ontario) to offer “The Mother of All Toddler Workshops.” The fee for this workshop includes a signed copy of the book and the chance to participate in an intimate, small-group workshop. I hope you’ll join me and/or spread the word to family members or friends living in the Peterborough area. On November 12, I’ll be giving a delivering “The Mother of All Toddler Workshops” to members of the Life With A Baby community in Thornhill, Ontario. The workshop is free for members and open to non-members for a nominal fee, but pre-registration is required. It’s the stuff of which parental nightmares are made. At a time of year that’s supposed to be all about gratitude, your child decides to demonstrate how extraordinarily ungrateful she is for the Thanksgiving dinner your parents or your in-laws just spent hours, if not days, preparing. It’s a cringe-worthy moment that can have you wondering if you are destined to raise the world’s most ungrateful kid…. The good news is that the situation isn’t nearly as hopeless as it may feel. Children can—and do—learn how to express gratitude. I shed some light on this seemingly mysterious process in my weekend parenting column for CBC Radio. What follows are the key takeaways from that column. Before we get down to the nitty-gritty and take an ages-and-stages guide to gratitude, here’s a quick refresher course on the benefits of teaching kids about gratitude. As it turns out, the benefits are considerable. Learning to recognize and act on feelings of gratitude is pretty much the recipe for a happy life — and it’s been that way for a very long time. Over 2000 years ago, the Greek philosopher Cicero described gratitude as “not only the greatest of virtues” but “the parent of all the other [virtues],” in recognition of the far-reaching benefits of expressing gratitude. And as for those benefits? We’re talking better health, better happiness, and better relationships. As the authors of a 2014 study published in School Psychology Review put it: “Teaching habits of gratitude to youth could affect their mental health and positive behaviour for years to come.” So it’s definitely worth the effort. If you’re expecting your toddler to express genuine gratitude (as opposed to, say, merely going through the motions of saying thank you), you’re going be terribly disappointed. According to child development experts, it takes time for children to truly understand what it means to feel grateful—and to know how to express that emotion to another person. You see, in order to feel grateful to another person you have to be able to see the world through another person’s eyes — to understand the sacrifices they might have made, big or small, to do this kind thing for you. Children aren’t capable of that kind of perspective taking until around the age of four, so they really aren’t capable of expressing genuine gratitude until that time. And, even then, that their understanding of gratitude is still very much a work-in-progress. Then, starting at around age seven, a child’s understanding of gratitude deepens. That’s when children become capable of understanding more complex emotions, like jealous, pride, and — yes — gratitude. And as their capacity to understand the feelings and motivations of other people continues to improve as they move through the teen years, so too does their capacity for feeling and expressing gratitude. They might suddenly recognize how much family time their sports coach is sacrificing for the good of the team and be moved to express gratitude to the coach for that sacrifice. Parents sometimes feel pressured to say things to their children like: “Don’t forget to say thank you to Grandma!” But, as it turns out, it’s not a particularly effective way to help kids to understand and express feelings of gratitude. If you force a child to go through the motions of expressing gratitude when he’s not actually feeling that emotion, spitting out that “thank you” is going to start to feel like a chore. Sure, your child may go through the motions, if only to avoid getting into trouble, but it’s unlikely that this new gratitude habit will stick — or at least not in any meaningful way. You’re merely teaching your child to fake an emotion that he’s not actually feeling — as opposed to encouraging him to recognize and act on genuine feelings of gratitude. Toronto mother of four Louise Gleeson has made a conscious effort to steer clear of this approach: “I want my children to learn about gratitude by experiencing it firsthand — as opposed to being told they should be feeling it,” she explains. Worried that you’re destined to raise the world’s least grateful child? You’ll be relieved to hear that there are things you can do to gently nudge the process along. You might want to encourage your child to notice how much time, energy, and/or effort some other person put into doing something kind thing – and to reflect on the ways they themselves benefitted from this act of kindness. According to the research, that’s what helps children to develop a sense of gratitude: being giving the chance to peek behind the curtain and discover for themselves just how gratitude works. So we don’t have to make these conversations about gratitude something big and complicated. And, as Angela noted, we don’t always have to express that gratitude in words. We can express it via a well-timed cup of tea! Looking for some fun Thanksgiving weekend activities to help spark conversations about gratitude? Here are a few activities to try with your kids. Got a kid who loves doing crafts? Consider creating a family gratitude collage (a collage of photos, drawings, and words that capture all the people and things you are grateful for) or making a gratitude paper chain (a chain made of individual paper links spelling out all the things you’re grateful for) or a gratitude paper quilt (similar to the paper chain, except in this case, you’re writing those words of gratitude on a series of squares and then assembling those squares into a quilt). Got a kid who is really into math? Make a gratitude graph! This is a fun exercise to try when you have a large number of extended family members and friends present in the same place at one time—like around the Thanksgiving dinner table. Each person records the things they’re grateful for on a series of sticky notes – and then you cluster everyone’s sticky notes together to create a graph highlighting family gratitude trends: “Seven people are grateful for this delicious dinner, six people are grateful for warm sweaters on a chilly day, five people are grateful that we’re all together, one person is grateful that the neighbour’s dog is finally finished barking….” That kind of thing. Of course, it’s important to remember that the activities themselves aren’t magical. The activities alone won’t teach kids how to feel and express gratitude. That’s your job as the grownup: to journey alongside them as they make their own gratitude discoveries. Want to learn more about getting to that happier, healthier place as a family? Subscribe to Ann's brand new newsletters: Ann-o-gram, Self-Care Buddy, and The Villager.